“Created by the Gods”, is the meaning of Bora Bora. 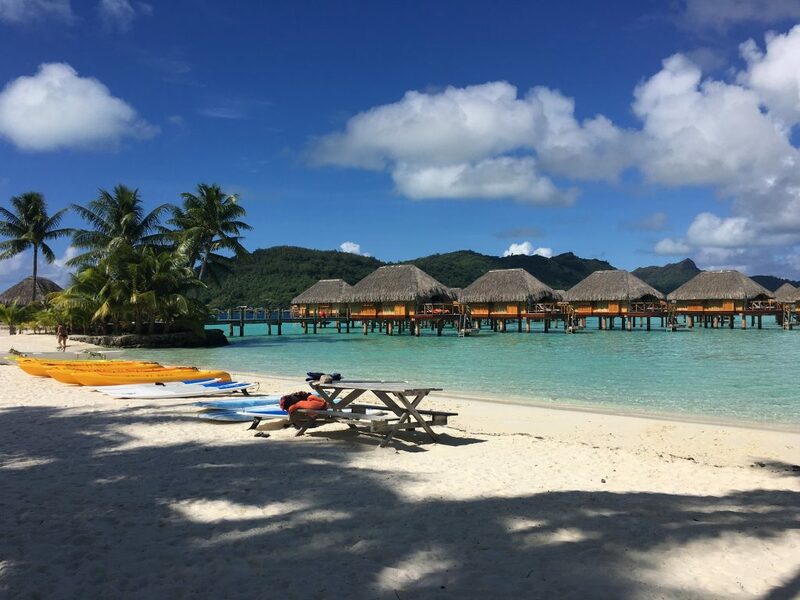 When we first saw Bora Bora in the movie ‘couples retreat’ so many years ago, we fell in love. But at the same time we were skeptical; could a place look THAT beautiful in real life? 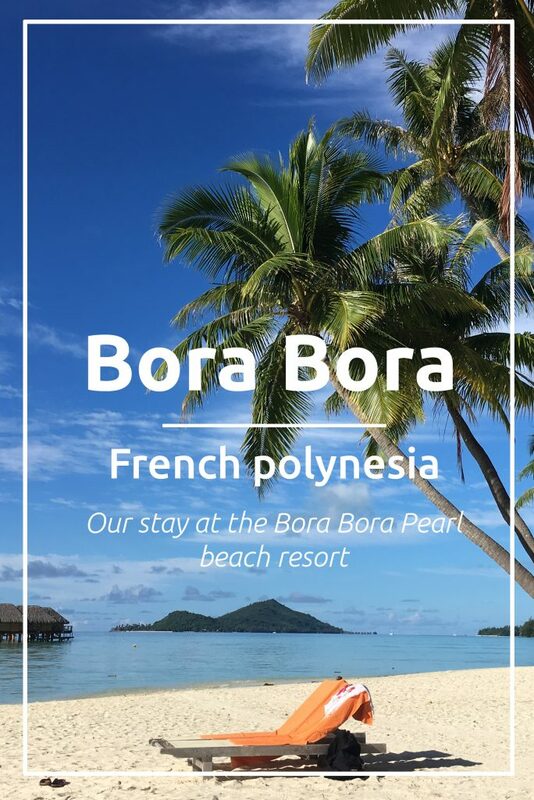 We are so grateful that we got to experience Bora Bora ourselves, and let us tell you: it’s all that you expect and more! In this article we will tell you about the resort we stayed at. In a different article we will share more about the excursions we booked and what other activities you can do in Bora Bora. The Beach at the Bora Bora Pearl Beach resort. The big resorts in Bora Bora, surround the main island making sure that you can see the iconic view of mount Otemanu from any angle. The Bora Bora Pearl beach resort is no exception. When we first saw that prominent silhouette of mount Otemanu from the beach, it took our breath away. 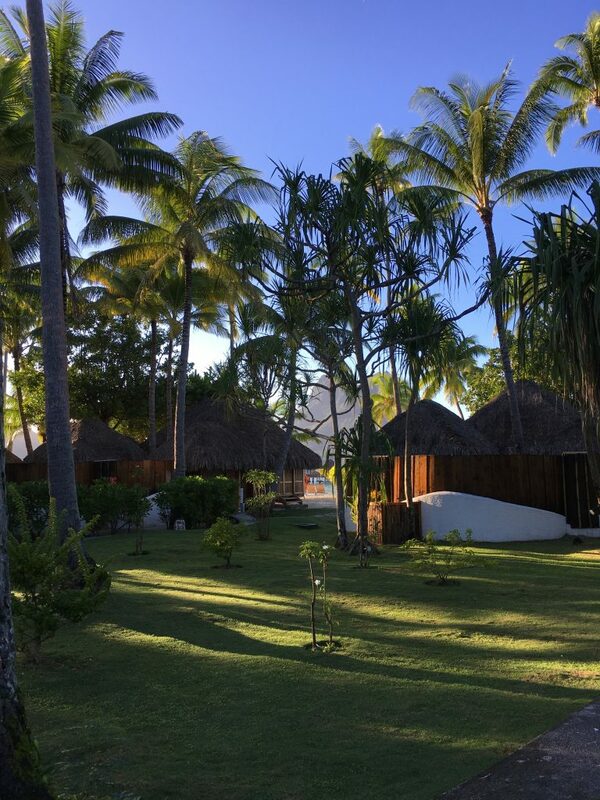 We think that the location facing mount Otemanu is a big advantage for the Bora Bora Pearl Beach Resort & Spa. 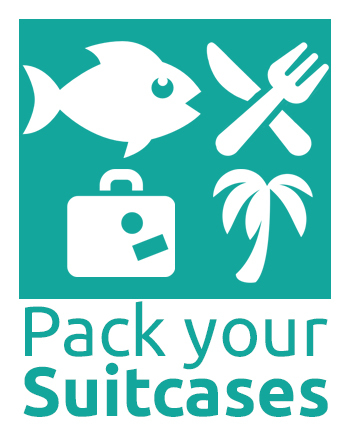 The resort is a short 10 minute boat ride away from the airport and the main Island. At this resort we stayed at a garden bungalow with private pool. The room included a little garden with two sunbeds and a small pool. You couldn’t swim in it, just sit in it so it wasn’t really a pool. The room was nice but at times very dirty. We found this such a disappointment because this is a very expensive resort in one of the most expensive parts of the world. The rooms should at least be clean! We did tell reception about this and they made sure that someone came around and cleaned, but there was no apology or anything. They had a very indifferent attitude towards our complaints. Garden bungalows at the Bora Bora Pearl beach resort. 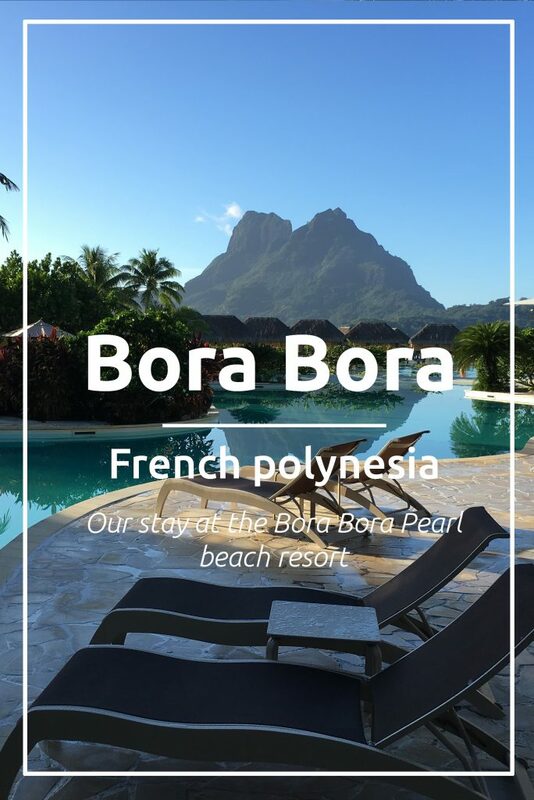 We felt that they didn’t care about keeping their customer service high because it’s Bora Bora, one of the most desirable places in the world for people to visit. So they don’t need to have an outstanding service because people will be visiting anyway. So for us, this is where this hotel lost points because above all: a hotel room should be clean! At this resort, we had a meal plan as including breakfast and dinner. There is a main restaurant where both are served and there is also a restaurant at the pool where you can have lunch. The breakfast was good with a lot of variety and a live cooking station where you could get omelets and pancakes. 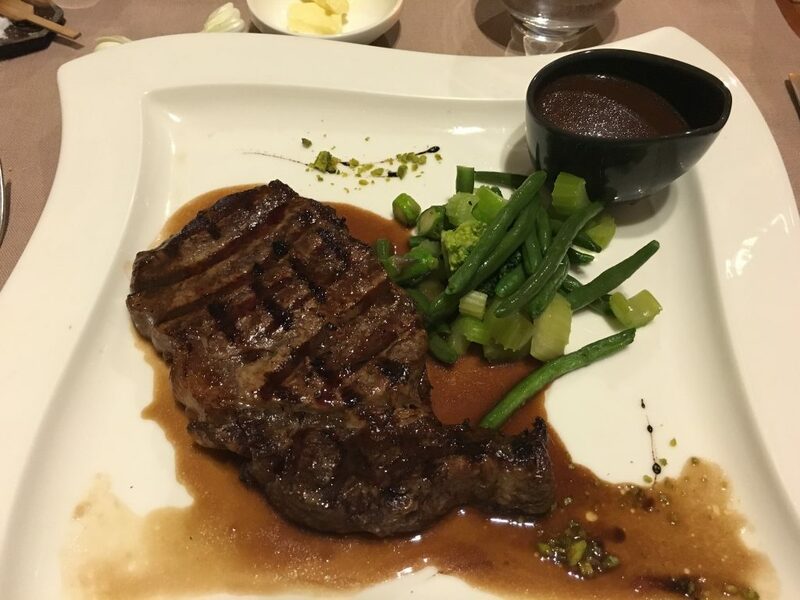 The dinner was 2 courses (you could choose a starter or a dessert with your main course) but after a few nights we realized that there isn’t that much to choose from if you are staying here for a week. The meal plan menu got a little tedious. However, the options that we choose were all very delicious. Lunch at the pool bar/restaurant was very good as well. They offered, burgers, sandwiches and pizza. Dinner/meal plan at the Bora Bora Pearl beach resort. The pool is a decent size with plenty of sunbeds. We loved that you have an amazing view from the pool as well. Our favorite however was the beach. 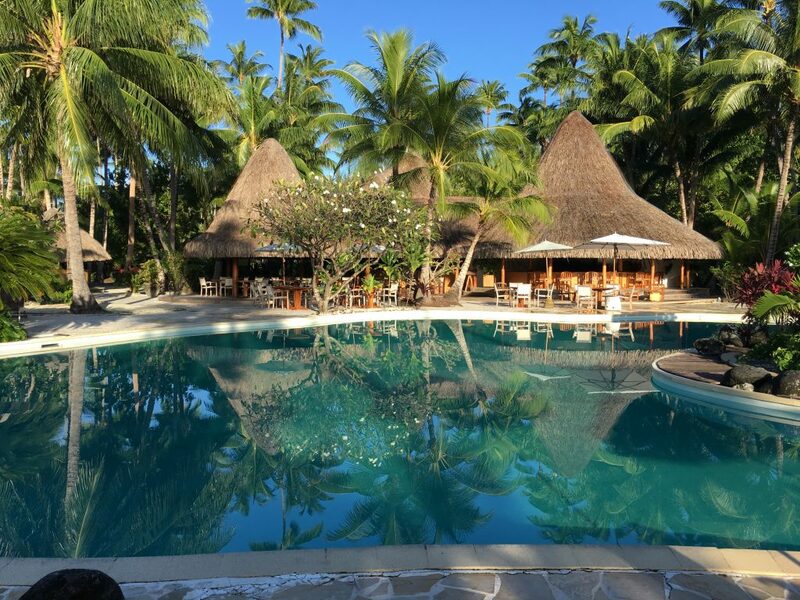 We loved seeing mount Otemanu right in front of us and the beach was never very crowded so it all felt very private and luxurious. There were very little sunbeds at the beach though. The resort provided kayaks and paddle boards which were great ways to keep yourself occupied on the water. In a little area between the overwater bungalows you can find a coral nursery with a lot of colorful fish. A nice area to snorkel. There is also a room where you can play pool (the room didn’t have air conditioning so it was very humid and hot) and a bar that has movie nights. Both are located above the reception. The resort also has a mini golf course, the course however can use some maintenance. The shuttle to the main island is free, however, you do need to get from the point where the boat drops you off to the main city of Vaitape. This does has a fare. However it was a nice experience to see how the real population lives on the main island, so we definitely recommend doing this. The pool at the Bora Bora Pearl beach resort. Some members of the staff were very unfriendly and seemed annoyed at times. They didn’t even say good morning or ignored you when you asked something. Rooms very dirty at times and need some improvement since they are outdated. Very little sunbeds at the beach. Not a lot of variety for dinner when you are on a meal plan + some dishes require additional payment. Turndown service was during the time most people got showered/ready for dinner, not very convenient. 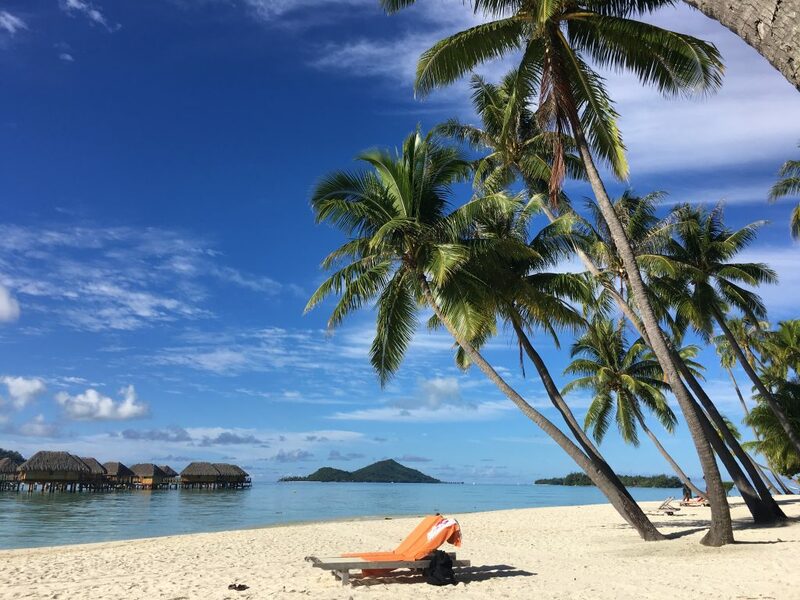 Like we mentioned before, the hotel was good but the service wasn’t outstanding: something that you would expect when visiting a luxurious and expensive place like Bora Bora. For us the service was a big disappointment. The view and amenities did make up for some of it. We won’t be visiting this particular resort the next time we visit Bora Bora. We feel that there are many other hotels where the service is much better. Why zakynthos the greek dream destination is, you need in your life.